The world is seeing the ushering in of an era of peace in the Horn of Africa region, for decades wracked by complicated conflicts. Over the past few months, several Horn of Africa countries have made up with their former enemies, spreading a mode of calm across the continent. The conflict between Ethiopia and Eritrea had for two decades cast a dark shadow over a region known for its ethnic and religious diversity, intricate politics and military convolutedness. Djibouti, for example, is a strong ally of Ethiopia, and consequently has been in conflict with Eritrea over Red Sea islands. Somalia has been without a central government since the fall of former dictator Siad Barre. It has accused Eritrea of supporting extremist Islamist groups. Moreover, Somalia and Ethiopia have not always been on good terms. In the 1980s the two countries were at war, after which Somalia accused Ethiopia of hindering negotiations to restore stability to the region. Sudan has also had its share of trouble both on the domestic and international fronts since the beginning of the rule of the National Islamic Front in 1989. 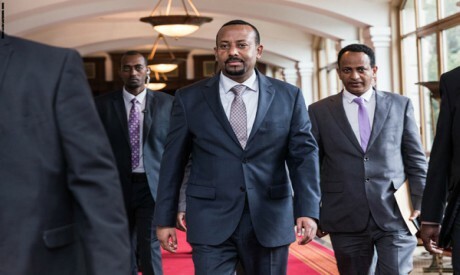 However, against this background of complicated conflicts, young Prime Minister of Ethiopia Abiy Ahmed took a leap towards peace with Eritrea recently, with which his country fought a bloody war that killed tens of thousands in 1998. Ahmed, himself from a military background, has been endeavouring to make peace partly because he is very familiar with the horrors of war. The discontent in Ethiopia escalated following the May 2015 parliamentary elections in which the ruling party won all 546 seats. A few months later the government devised a master plan to develop the capital Addis Ababa by extending it into the surrounding farmland of Oromia state. The Oromo people make up the largest ethnic group in Ethiopia, comprising 34 per cent of the population, and Addis Ababa is located in the heart of Oromia. Protests erupted between the Oromo people and the security forces in January 2016 against the expansion plan in which 140 people were killed. Before calm was restored, the Amhara people in the north of Ethiopia also started to demonstrate against the government, with human rights groups claiming that 500 people had died in confrontations with the security forces. Shortly after this, the government announced a period of emergency rule. At the same time, much of Ethiopia was suffering from famine as a wave of droughts hit the country. Growth rates went down to eight per cent after they had recorded the highest in Africa at 10 per cent. The ruling Ethiopian People’s Revolutionary Democratic Front then accepted the resignation of prime minister Hailemariam Desalegn, appointing Ahmed in his place. “It is not peace in the Horn of Africa that is the regional or international problem; rather the problem is what Ahmed is facing domestically,” Mahmoud said. “Since their ascent to power in Ethiopia in 1991 under the umbrella of the Revolutionary Front led by former prime minister Meles Zenawi, the Tigrayans have been in control of the state and army. They would not allow other groups to share power,” he added. “As the largest ethnic group in Ethiopia after the Oromo and the Amhara, the Tigrayans are army leaders, and many of them are in control of the country’s institutions. On the other hand, the present prime minister’s privatisation decrees are bothering the Ethiopian deep state as they tighten the noose on the bureaucracy and its political and social control,” he said. Ahmed has announced that Ethiopia will step up the participation of the private sector in government projects, banks and communication institutions. “Peace in the Horn of Africa started the moment Ethiopia took the first step towards Eritrea. It meant everybody had to make peace with everybody else. Without the domestic difficulties being solved in Addis Ababa, there will be no stability,” Mahmoud said. Other Horn of Africa leaders are moving quickly towards peace. Somali President Mohamed Abdullahi Mohamed visited Asmara in late July to normalise relations with Eritrea. Mogadishu had earlier accused Asmara of supporting Islamist extremists, especially the Al-Shabab group, branded a terrorist orgnaisation in Somalia and Ethiopia. Many observers believe that the Eritrean support aimed at confronting Addis Ababa that sent its army to face off against the Somali Islamic Courts Union, which later disintegrated to the benefit of Al-Shabab. In order to solve the two-decade dispute between Djibouti and Asmara, the leaders of Somalia, Ethiopia and Eritrea also met at a summit hosted by Eritrean President Isaias Afwerki. In 1996, Djibouti and Eritrea were on the brink of war following the former’s accusations that Eritrea had bombed Ras Doumeira on the border between the two countries. Three years later, Eritrea accused its southern neighbour Djibouti of siding with Ethiopia just as the war between Asmara and Addis Ababa was over, whereas Djibouti claimed Asmara was supporting anti-regime rebels. In 2010, Qatar mediated between the two counties and sent peacekeeping forces to the region. However, Qatar later recalled its peacekeeping forces from Ras Doumeira, though this did not lead to further fighting. “This proves that Horn of Africa conflicts are much more complicated and cannot be taken advantage of by the Gulf countries,” stated Mahmoud. “It is the international powers and the internal structure of the states concerned that govern the conflicts in the Horn of Africa and the Nile Basin regions, especially in overpopulated countries such as Ethiopia and Sudan,” he continued. Rapproachments and reshaping alliances in the Horn of Africa have helped to keep the region away from the repercussions of the present crisis in the Gulf. While settling the border conflict between Eritrea and Djibouti is very possible, Ethiopia’s domestic affairs remain the most important factor in calming the Horn of Africa region.